Your online ordering made easy: One stop. Smart shop. 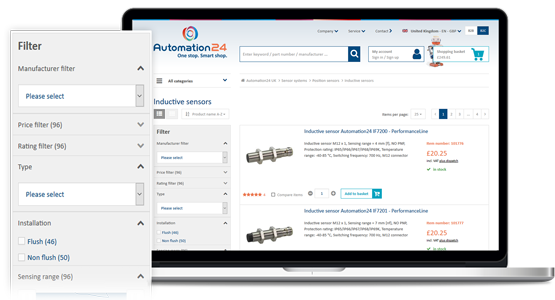 At Automation24 you will find automation technology for the best price and from a single source. 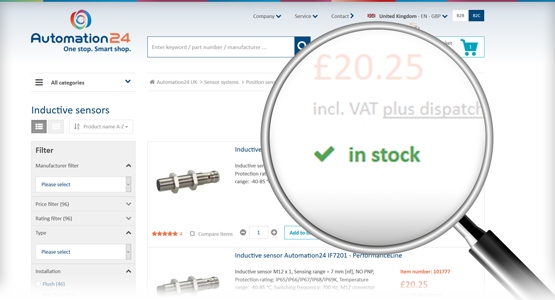 To make your ordering process as easy as possible, we rely not only on our customer service team but also on our smart features in our online shop. In this way you will find the right product quickly and conveniently. In the following information you can get an overview of our practical shop features. Even before registering, you already benefit from helpful features that contribute to a pleasant shopping experience and and lead quickly and accurately to appropriate articles. Our shop is especially geared to the needs of business customers. Once you are logged in, you will also have access to a number of useful features that make the ordering process considerably easier. 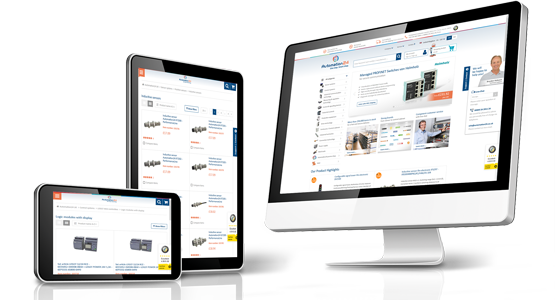 The shop has been optimized for all devices from PC to tablet to smartphones. As a result it gives you the most convenient shopping experience – whether in the office or on the road. 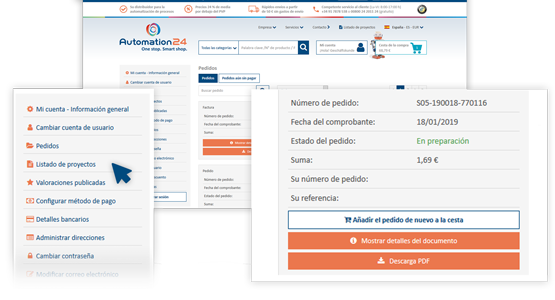 At Automation24 there are no complicated price and discount agreements. All prices are equally valid for each customer and appear without previous login directly with the product. Thus you also directly recognize the cost savings compared to the recommended retail price from the manufacturer. Thanks to product icons for each category, the navigation is intuitive to use. You can open the menu items either by placing your mouse over them or by clicking directly on the categories to see the overview of the associated subcategories. 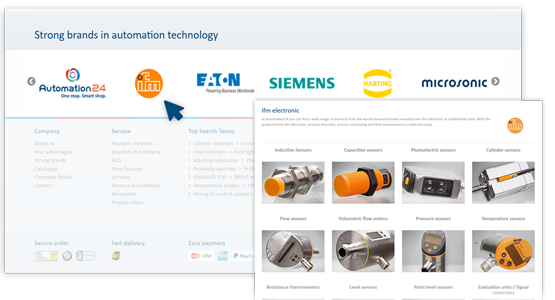 At the bottom of each shop page is our handy brand slider, which provides you an overview of our manufacturers. With a click on a logo of your choice you go directly to the exclusive manufacturer page. In addition to further information, here you can also find an overview of the product categories of the respective manufacturer. Just simply click on one of the categories to go directly to the corresponding products of the manufacturer. 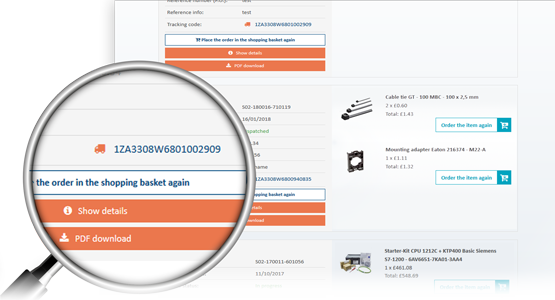 The error-tolerant search, the direct order feature from the basket, as well as the search for products with similar technical characteristics lead quickly and accurately to the right product. Enter your search terms at the top of the page in the search box and we will make direct suggestions via the drop-down menu about your request. The suggestions are divided into up to three types: Category, product and manufacturer pages. Just click on the suggestion that suits you to be directed to the corresponding page. Our intelligent search also overlooks small typing mistakes and leads you nevertheless to the goal. If you are already in the shopping basket and you think of additional items that you would like to add quickly, you do not have to take time to navigate back through the categories. Just simply use the practical direct order function from the basket. 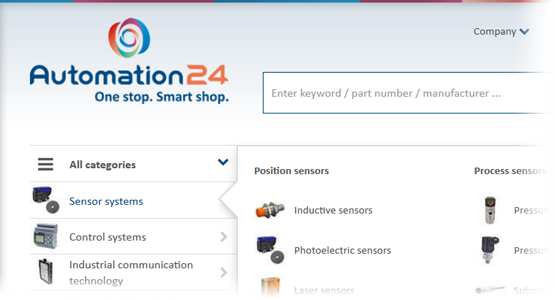 After entering the category or product name, a drop-down menu with suitable product suggestions will open for your input. 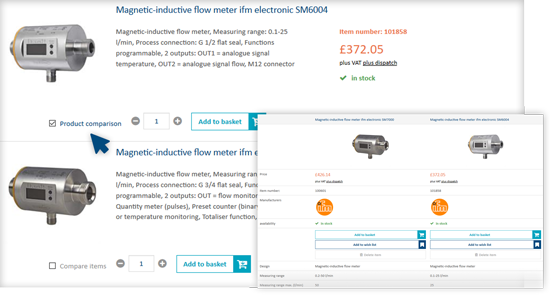 With the help of the product comparison feature, you can see the differences in any number of items at a glance. 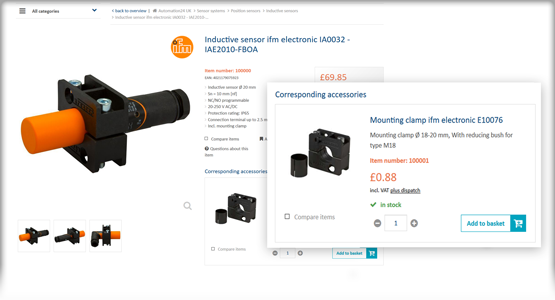 Simply click the check box at the category level of the desired items, and then click on Product Comparison. . In the search for the right product, we also support our detailed controllable technical feature filter function with which you can select according to manufacturers, price ranges and technical specifications such as design, installation method, voltage type and much more. Depending on the subcategory you are in, you will be presented with relevant filter options. 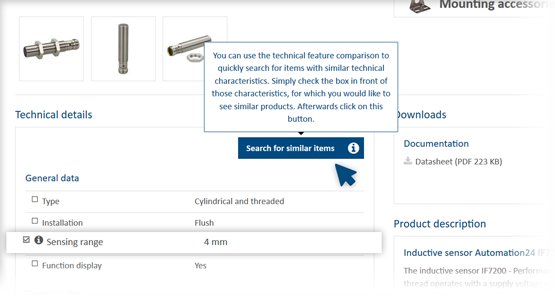 The technical feature filter can also effortlessly be used for products with similar technical characteristics to find and compare them together. 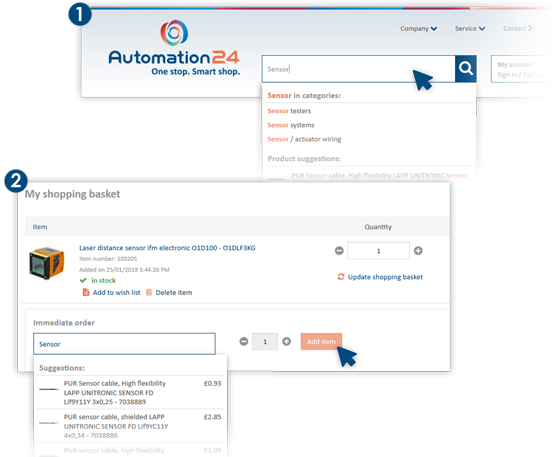 In the checkbox simply select the characteristics for which you want to see more products and then click on the button "Search for similar items". It then opens an overview of products with your previously selected characteristics. 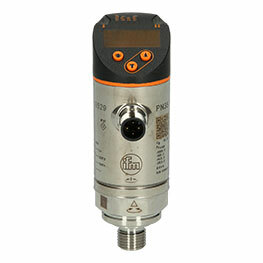 For each sensor you need the appropriate sensor cable and for each controller the appropriate expansion module. With us, you do not have to search long for the right accessories. On each product detail page we suggest the appropriate products for you. For each product you will find comprehensive product information in the form of short facts, clearly listed technical data and product descriptions. 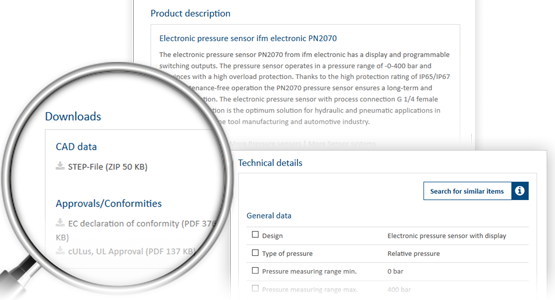 If you need more information, you can also download datasheets, declarations of conformity and CAD data from the product page. Our stocks are displayed in real time in our shop. 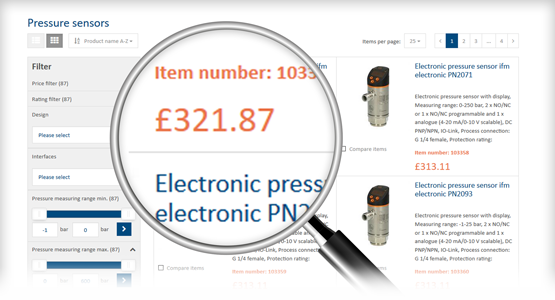 This enables you to see at a glance whether the desired product is available from stock. All products that are green, we have available in sufficient quantities from stock. All other products are already on the way for further delivery. 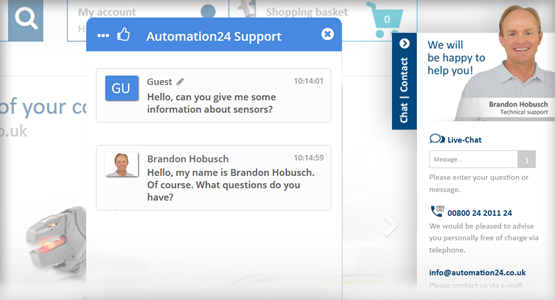 Should not all your questions be answered online, you are welcome to contact us any time – via the Live-Chat, which you can access on the right sidebar, via telephone at the toll free telephone number 00800 24 2011 24 or via e-mail at info@automation24.co.uk – we are here for you and answer your technical questions about our products. Thanks to the One Page Checkout, you can now find all information clearly displayed on one page before the transaction is completed. This saves valuable time. Here you can easily create different contact persons with their own address editing options. All orders can be viewed and managed via the main account. Simply in My Account under Invoice delivery, select which billing type you prefer as your default. 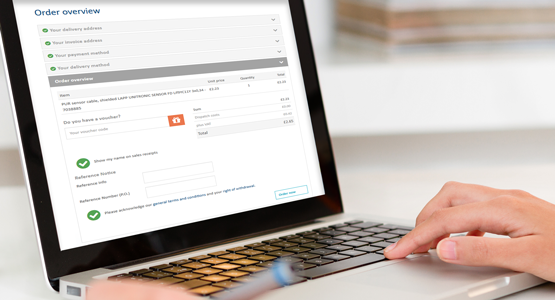 You can choose whether to receive the invoice in classic paper format via mail or in electronic form via e-mail. Optionally, you can also set a different email address here. 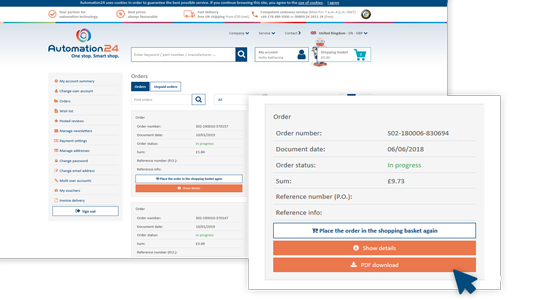 In your account under the section Orders, you can not only see the order status and general order history but by clicking on the PDF download button you also can download at any time the respective digital documents for your orders. 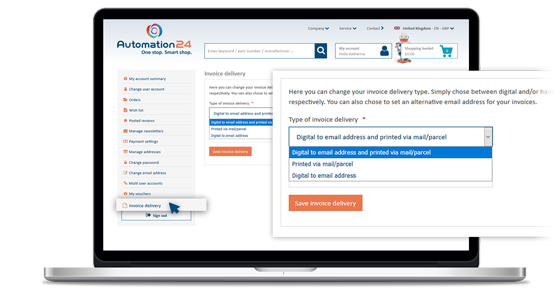 So you never lose track and always have control over your ordering processes at Automation24. Unless you have selected the delivery method Pickup, you can after the items are dispatched under Orders view the tracking code of the package. This way, you can track your shipment and remain up to date. 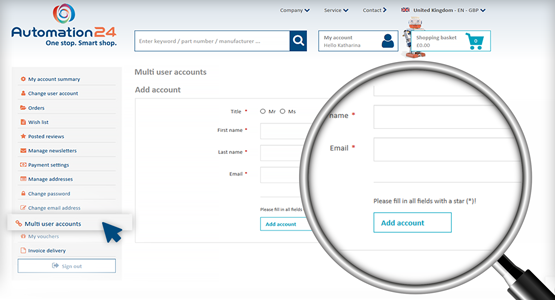 Under Orders you can repurchase previously purchased products with one click or repeat complete orders. But you also have the option to use the Wish list feature in your account to make it easier to place recurring orders or to mark new products for your next order. You can stay tuned! We are already working on other new shop features, which we will introduce to you here very soon.